Mrs. Karen Heist is the 2015 David Cox FLAVA Excellence in Teaching K-12 Award recipient. As a Spanish teacher and lead teacher for her department at Woodside High School in Newport News, Karen has made remarkable contributions to her school and community and continually seeks to improve her craft and expand her understanding of her content area. As the leader of the Spanish team for curriculum writing process in her division, Karen had the challenging task of keeping her team focused and mediating among equally passionate teachers with sometimes conflicting ideas. She guided the team through the process of developing thematic units, attended extra meetings to develop Essential Questions and Enduring Understandings, refined exams and performance assessments, and edited other documents. It is believed that her leadership during the writing process and her enthusiasm for the new curriculum were in large part responsible for its successful implementation throughout the division. Her outstanding classroom management, which springs from the positive relationships she builds with her students, her professional and respectful demeanor in all situations, and the high academic expectations she maintains, contribute to her effectiveness as a teacher. After 25 years, she is as enthusiastic as ever about teaching the Spanish language and culture and she regularly seeks out opportunities to grow as a professional and as an individual. Over the past 20 years, she has participated in summer study abroad in Spain, earned a Master’s Degree in Field-based Curriculum and Instruction, became a National Board Certified teacher, was chosen as one of only ten American participants for the Fulbright Uruguay Educator Exchange Program, and completed a grant-funded collaborative project with her Fulbright exchange partner to produce a bilingual children’s book related to their experience. Most remarkably of all, Karen Heist has balanced her many professional accomplishments with a busy family life. She and her husband have raised ten children and play an active role in the lives of their 20 grandchildren. She is involved in her community and her church, and has participated in numerous international mission trips since 2003. In addition to receiving an engraved clock, Karen was given a VDOE board resolution by Lisa A. Harris, Specialist for Foreign Languages and International Education for the Virginia Department of Education. Dr. Kathryn Murphy-Judy, the 2015 Helen Warriner-Burke FLAVA Distinguished Service Award recipient, is well known to many members, and her curriculum vitae is so very impressive. Actually, it is rather daunting! Her nominator for this recognition wrote, “Kathryn Murphy-Judy is most deserving of the FLAVA Helen Warriner-Burke Award for Service. Dr. Murphy-Judy has been a well-respected and sought-after presenter at numerous FLAVA Conferences throughout the years. She has presented workshops through FLAVA’s Professional Development series (out of Washington and Lee). As president of FLAVA, she oversaw the very successful move of the FLAVA Conference from Richmond to Williamsburg, the improvement of the FLAVA website (bringing it into the 21st century), brought the FLAVA treasury back into compliance, and began the process of revising the FLAVA Constitution. Under Dr. Murphy-Judy’s governance, the FLAVA conference grew tremendously in the number of sessions and workshops presented, firmed itself as a full-fledged three-day conference, and increased attendance to record numbers. The professional development opportunities for members grew tremendously. Dr. Murphy-Judy’s advocacy efforts resulted in numerous benefits for the membership as well as for unaffiliated educators as she afforded many opportunities for teachers who lacked funds to attend the FLAVA Conference and other programs. She was instrumental in organizing VATA, the association of teachers of Arabic, and bringing it into the FLAVA umbrella. In addition to receiving an engraved clock, Dr. Murphy-Judy, a French professor at VCU, was given a VDOE board resolution by Lisa A. Harris, Specialist for Foreign Languages and International Education for the Virginia Department of Education. It is a privilege to honor Dr. Steven L. Walts, Superintendent of Prince William County Public Schools, as the Friend of FLAVA Award recipient for 2015. In his ten years as superintendent, Dr. Walts has demonstrated how much he values the linguistic and cultural diversity of the students, staff, and parents of the Prince William County community. His nominator gave several examples to support this. Upon Dr. Walts’ arrival to PWCS, he made it known immediately how much he appreciated the hundreds of languages and cultures represented within the community. For this reason, he preferred to have the program called “World” and not “Foreign” language as he wanted to be inclusive in recognizing the current demographics and representation of all of the students. He immediately made sure valuing diversity was listed as a core value of the Division level communication pieces such as the Culture Statement, Strategic Plan, and definition of World-Class, and mission statement. Secondly, in 2006, Dr. Walts took a huge stand in the fallout of the immigration debate and the ensuing proclamations in the county focusing on the illegal or undocumented families. He ensured all the families that schools were safe for both them and their children, as long as they lived and slept within the boundaries of PWCS. When the political scene continued to spill into the schools through 2007, and students became vulnerable to counter arguments to join the protests, Dr. Walts insisted on heading to the site of the biggest protest, a local supermarket. With hundreds of protesters around the parking lot, he took a megaphone, jumped on a vehicle, and with an interpreter, begged the students to return to their schools for safety and to pursue their dreams of graduating. He urged them to voice their concerns in school using safe channels. He later provided an opportunity for the students to meet and voice their concerns. What mattered the most to the students, is that he kept his word; he listened and made them feel valued and validated, and it happened in Spanish. He was a hero to them and to many of the educators who saw the risk he took to take these actions so soon into his tenure. Third, Dr. Walts also valued having language diversity in staff which he quickly identified as an area of need after visiting all schools. He established a long-term relationship with Visiting International Faculty and announced a Division goal to have one VIF teacher in every school. Fourth, Dr. Walts sought to expand the Primary Years Program of the International Baccalaureate Program to eight elementary schools. Unfortunately, finances were a huge issue; however, the county has phased in world languages at three of the IBPYP schools. A fourth school wanted to phase in Chinese, but it was short about $15,000 towards the teacher salary. At a Superintendent’s Staff Meeting, he literally passed a container around the table requesting his nine associate superintendents to contribute money from their budgets to cover the deficiency. The money was promptly transferred and Chinese language instruction was successfully implemented. Fifth, Dr. Walts has always supported and asked for as many language options to be offered as possible in the PWCS middle and high school programs. With over ten languages being offered, he desires to add others that reflect critical 21st century needs and he continues to support the integration of international perspectives in the curriculum and programs for all students. Without a doubt, Dr. Steven L. Walts has proven he is deserving of The Friend of FLAVA Award. 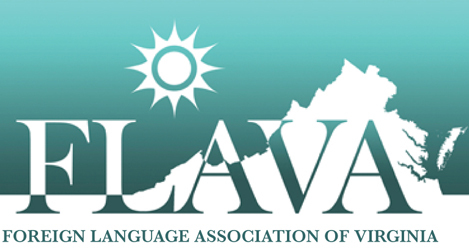 FLAVA initiated a new award last year to honor up to five college and university students who exemplify a keen interest in language study. The recipients are honored with free registration for its annual conference and free membership for one year. The following are the 2015 winners. Her nominator states that Caroline has distinguished herself by participating actively in the Spanish and TESL activities. Her high academic performance is complemented by her enthusiasm for her future language teaching career. Caroline is studying to become a Spanish and ESL teacher, and has already made many contacts with classroom teachers in her county. She currently serves as the Late-Night Director for Lancer Productions, Longwood University’s student programming board. In addition to these activities, Caroline has worked for CVS Pharmacy for over two years, and is a licensed pharmacy technician in Virginia. Alexis has been active in both the German and Modern Languages clubs, rarely missing an event. At Longwood she is in Peer Health Educators, where she not only advises service projects, but is also the new member chair. She is the student liaison for Modern Languages on Longwood’s Student Advisory Board. As a member of Sigma Alpha Pi which is the National Society of Leadership and Success, she won the National Engaged Leader Award for going above and beyond requirements to be in the organization. In addition to her contributions to her university, Alexis is already engaged with the best practices of the language profession as she attended last year’s FLAVA conference. Because her nominator has taught Emily from intermediate French to French 366: Business French and Culture, he has seen her remarkable progress and dedication to the study of French. Both he and his colleagues unanimously voted her the best French major last year, and she will be inducted into Pi Delta Phi, a very selective French Honor Society this fall. She spent a semester studying in France, but her enthusiasm and commitment are not limited to the classroom. She has worked tirelessly for the Norfolk Historic Cemeteries and the Keep Norfolk Beautiful group as well as participating in food drives, etc. for the needy in the Hampton Roads area. Her nominator states that she can think of no student whom she has taught in recent years who has shown more excitement and drive for learning languages than Andreea Sandu. In terms of her achievement, her curiosity about the material being studied, her desire to go beyond the limits or expectations of the course, and her near perfect performance on all written and oral exams and other course assignments make Andreea a superb student. By the age of four, Andreea was already fluent in Rumanian and English, and begged her parents to send her to French lessons. As there were no French lessons at her school, she took three years of German instead. She finally got to study French in eighth grade. She continued studying French and German throughout high school (excelling in both languages). Encouraged by her progress and her fascination with how language in general works, she decided to study on her own Italian and Afrikaans. In recognition of outstanding academic success and to honor our fallen colleagues, Jamie Bishop and Jocelyne Couture-Nowak of Virginia Tech, FLAVA awards a one year membership to the following.